Inauthentic Design, Faux-aged, Overpriced, and… Very Cool? The J. Crew Timex “1940s Military” Watch left me altogether unimpressed when released in late 2008, and there are still many reasons not to get overly excited about this watch. I remember thinking at the time that it might have been worth a look if it were priced in line with Timex’s more typical quartz offerings, but at 5x the expected price it just didn’t catch my interest at all. And of course, this is even coming from someone accuatomed to spending several times that figure on watches of interest. With its hodgepodge styling and a bevy of conflicting and anachronistic design elements, faux distressing and aging that is the absolute antithesis of the patina or honestly earned “wabi” treasured on genuine vintage watches, and what seemed an arbitrarily high price for an otherwise unremarkable, uncomplicated quartz watch I couldn’t get excited about this one. 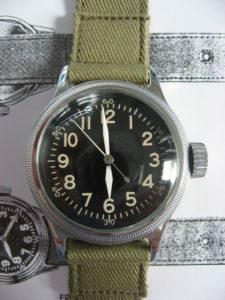 Actual WWII Elgin 'A-11' US military watch, on which the J. Crew watch was purportedly based but shows few real similarities. Timex made no military issue watches in this era, and the J. Crew watch bears few common characteristics. The only thing that really seemed worthy of note at the time was that it seemed a continuation or even expansion of the recent penchant of many big-brand modern retailers for featuring models wearing vintage watches in catalog photos, a trend that has continued gathering momentum in recent years. And indeed, J. Crew has even been seen previously to even carry vintage-styled one-piece nylon straps in “regimental”-style patterns, even if little attention is paid to the actual meaning and tradition behind them. At J. Crew’s behest Timex must have reached very deep into… somewhere else for this design as from a historical standpoint the resulting watch is a figment of its own imagination. In actuality Timex never made a watch quite like this for the US military; and neither did anyone else in the 1940s. The styling is actually much closer to that of US military watches from several decades later with an arbitrary assemblage of design cues lifted from watches Timex made for the civilian market in the 1950s-1960s. Timex 46374B Plastic watch made for US military circa 1982, from which the J. Crew model presumably draws its cue. Issue Timex watches are actually very uncommon. 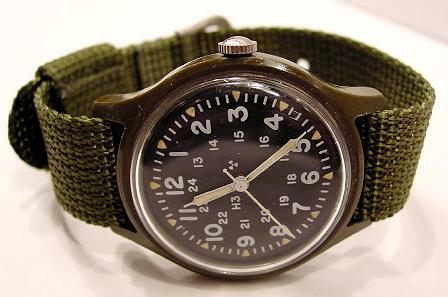 Despite the modern perception of Timex as the eponymous “American” maker of practical everyday watches, Timex actually made startlingly few wristwatches for the US military. Timex and its various corporate siblings made a variety of mechanical timing devices and instruments for the United States military. In fact the “V-conic” escapement that made Timex famous for its sturdy and inexpensive movements in the 1950s was originally developed by the War Department during WWII for use in mechanical time artillery fuses. However, Timex made no watches for the military in the stated 1940s time period. 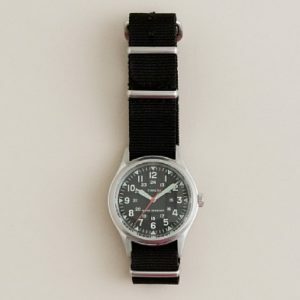 Genuine US Military issue Timex watches are actually very, very uncommon and are seldom seen even among dedicated collectors, so much so that a mere sighting on its own is itself worthy of mention. And it’s perhaps just as well, as with the made to according to spec plastic cases and inexpensive movements the military issue Timex watches are mostly unremarkable apart from their relative rarity. They’re otherwise forgettable, if not even perhaps regrettable. Perhaps the erroneous “1940s” date given is just a simple oversight by the J. Crew copywriters, but it’s perhaps a deliberate marketing decision based on more favorable modern opinions surrounding the US contribution in WWII as opposed to the Vietnam years. It remains however that the J. Crew Timex “Military” watch actually bears a more direct stylistic lineage to watches of the Vietnam and Cold War eras. As well, it could perhaps be a simple attempt to artificially push the perceived period associated with watch earlier to make it seem older and ostensibly more desirable. J. Crew Timex caseback with "Circa 2008" caseback. Photo: Alan N.
The caseback includes a tongue-in-cheek “Circa 2008” inscription, which is amusing as its designers presumably knew exactly which year it was when making the watch. The choice of a red sweep center seconds hand is slightly incorrect for a true military design, but on a “vintage” Timex it might be forgiven as it was once a signature Timex design aspect on models like the famous Timex Marlin. In fact, the same can probably be said of the overall watch as a whole: inaccurate perhaps from a strict military collector standpoint, but forgivable perhaps and the watch itself is nice and respectable enough in its own right if one can manage to look past the inaccuracies, pretension, and pricing. And in spite of all this, in the meantime this outwardly goofy J. Crew Timex “Military” watch has turned out to be surprisingly popular in certain fashion circles, popular with the sort of people who wear and make blue jeans that seem really excessively and irrationally overpriced until you learn that they’re made with 1960s style denim fabric, based on an actual 1930s railroad engineer work pants pattern, and sewn on slow, obsolete vintage equipment. At which point they begin to seem only slightly less overpriced. Perhaps owners are looking for that vintage inspired or military-esque “clean” styling, but with the reliability and convenience of a modern quartz movement. And targeting this market may also explain the price point: without a premium price attached the watch can seem unconvincing and unremarkable. Some of the markup might well relate to an inability or decision not to exploit economies of scale with such small production and limited distribution, but much of the price likely represents an artificial premium perception. But what’s really notable here and what inspired me to write this bit isn’t readily apparent on the surface, or at least it wasn’t to me at first. Take a look at the strap J. Crew includes on their “military” Timex. On its own it’s not especially remarkable, recognizable as what collectors call a “NATO” strap, based on the old British G10 pattern. But though commonly seen about the intertubes these days in collector communities worldwide, with a little bit of thinking we can realize that a G10 is enormously out of place here. Neither Timex nor any other maker ever made watches on G10 straps in any era. Though perhaps very suitable from a functional standpoint, the pattern was fairly closely confined to British issue. So what’s a G10 strap doing on a “1940s US Military Timex Watch” if it’s so out of place? It’s an artifact of designers “coolhunting” in internet watch forums for design ideas. There’s just no other explanation for it. The G10 pattern is (or was, at least) actually quite uncommon in the wider market, and in fact it was only with the advent of internet collector communities that it managed to spread beyond a limited niche of UK military issue. It wasn’t too many years ago that they could only be had by making a pilgrimage to particular brick-and-mortar dealers. The inclusion of this little out-of-place element is enough to make me reconsider my opinion of this watch. While still mostly unremarkable from a horological and military collector standoint, the inclusion of the little artifact makes the watch something more than it might be on its own: it’s a designer vote of approval for internet watch collectors by two major brands. Nearly the EXACT same watch, aside from the watches frame. It is indeed pretty close, but just with a plastic case instead of steel and without the faux distressing. Oddly, J. Crew even sells that very watch themselves. 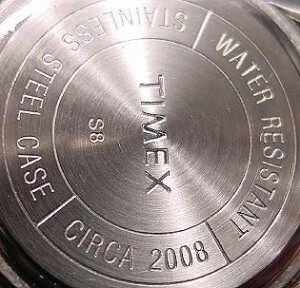 But although Timex markets it as a men’s military model, J. Crew describes it as a “Kid’s Camper” watch for some indiscernible reason. why so bitter? Nobody buying this watch cares about its lack of historical authenticity. My father was an Air Force F-4 Pilot in the 1960’s-70’s. The J Crew watch looks like the US Air Force Issue watch he always wore – so much that seeing it in the case at the store stopped me in my tracks. My husband (who flew F-16s in the 1980’s) told me that the watch issued during that his time was much cheaper looking that my Dad’s watch and the one they currently sell at J Crew. I’m sorry it’s 150 bucks — why all the fuss?